The M5-2-COF coefficient of friction (COF) gauge is an integral part of a COF testing system, typically including a motorized test stand and COF fixture. With a capacity of 2 lbF [10 N], the gauge can be used to measure friction for a wide range of materials, ideal for conformance to ASTM D1894 and other relevant standards. Static and kinetic coefficients are displayed on the backlit LCD, and are calculated from a user-programmable sled weight. The M5-2-COF may also be used for a number of common tension and compression testing applications. The gauge is based on Mark-10s Series 5 advanced digital force gauges, and includes the series full set of functions and settings. The M5-2-COF includes MESUR™ Lite data acquisition software. MESUR™ Lite tabulates continuous or single point data. Data saved in the gauges memory can also be downloaded in bulk. One-click export to Excel easily allows for further data manipulation. 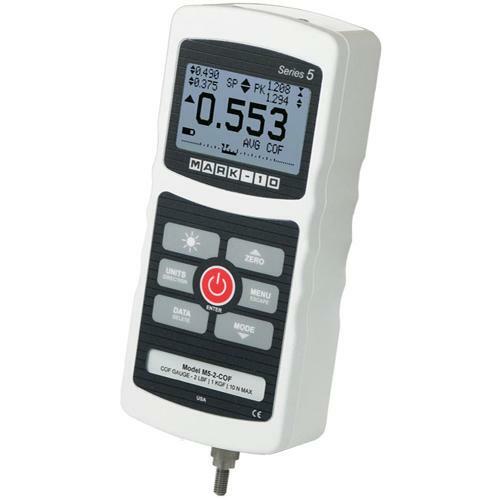 Carrying case with hook, chisel, cone, V-groove, flat, extension rod, universal voltage AC adapter, battery, quick-start guide, USB cable, resource CD (USB driver, MESUR™Lite software, MESUR™gauge DEMO software, and users guide), and NIST-traceable certificate of calibration with data. The fixture includes a large work table with sample clamp, level, 200 g sled, cable, and low-friction pulley. The fixture is directly compatible with the M5-2-COF gauge, ESM303 test stand, and ESM301 motorized test stand.